I adopted a rescue horse about 2 years ago from a local rescue organization. 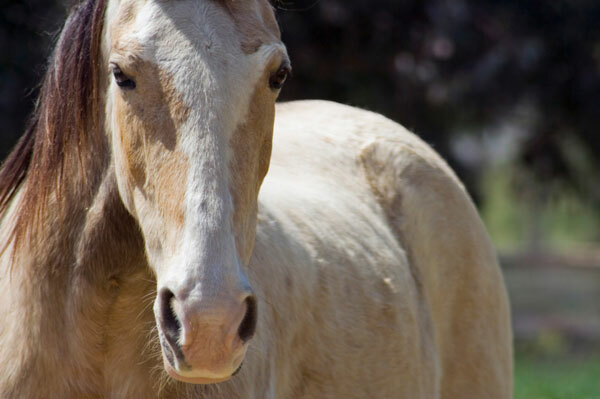 A buckskin gelding that is now about 9 years old. I have had him at the current boarding facility for 1 1/2 years and we have done a couple months of training board where he has progressed extremely well. I’ve noticed that this spring and through this past winter his coat seems to be coarse and staticy at times. He is being fed Purina Strategies feed, which when we switched to this late last summer I saw a dramatic change in his mane and tail that became nice and soft instead of brittle. They are still in nice shape. I was thinking of adding flaxseed to his grain daily. Is this a good thing to do? He is also currently on Fastrack Probiotics & has unlimited access to rough forage both in his stall and in pasture. He doesn’t seem to eat a lot of of hay though so my vet suggested trying alfalfa forage for him on the side so to speak. I purchase the Triple Crown Alfalfa forage and put it in a bucket in his stall. He eats both it and the hay. I just don’t understand why his coat is looking so rough and feels so coarse. Am I on the right track with adding the Omegas in a form of flax seed? We had been using Legends Omega supplement but for the price of it and after researching more and more it seems that using ground flax seed is a healthier and cheaper alternative to that. He is also given Purina Strategies mixed with oats and Fastrack Probiotics. Thanks! I’m completely new to the owning horse world, maybe not the smartest thing to start with a rescue horse as my first horse but I fell in love with him and now that he has had more training and I am learning how to work with him……I think we are working out just great. Good for you for adopting a rescue horse! It sounds like you’re on the right track with nutrition, training and other aspects of his care, you just need a few tweaks here and there. If you and your veterinarian are satisfied there are no underlying health issues that could account for his rough, coarse coat—like parasites, ulcers, etc—then absolutely try another source of flax seed for the omega 3 fatty acids it provides. Be warned though, you may find (after daily soaking or grinding) that the price of commercial, stabilized flax seed products is not so bad after all! In addition to flax seed, there’s my new favorite plant-based source of omega 3s, chia seed (yes, that chia). The seeds from the chia plant have even more omega 3 fatty acids than the seeds of the flax plant and are a powerhouse of other nutrients. There’s also fish oil, which may be an excellent choice for your guy. Not only is it super-high in omega 3s, the fatty acids consist of pre-formed DHA and EPA, the two forms of omega 3 fatty acids that the body is not super efficient in making on its own yet have the most health benefits. Make sure your guy is getting plenty of turnout (fresh grass is a plus) and grooming and I predict his coat will bloom in no time!